He was born in 1990 at Kazan. In 1997 he entered the Central Special Music School at the Kazan State Conservatory (Class of Honored Artist of the Republic of Tatarstan Irina Lapteva). In 2008 he entered the Zhiganov Kazan State Conservatory (Class of the same Teacher). Since 2013, Post-Graduate Student of the Kazan State Conservatory (Class of People's Artist of Russia, Professor Sergey Roldugin). 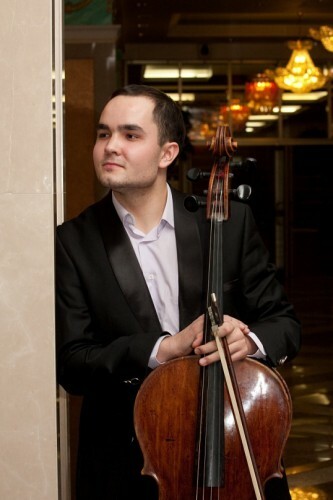 2014 - II Prize Winner at Davidov International Competition and Special Prize for the Best Performance Davydov Pieces. In 2007 he was awarded by the Ministry of Education and Science of the Russian Federation for Support of Talented Youth. In 2008 he became the Fellow of the Ministry of Culture of the Republic of Tatarstan. In 2011, he was the Winner of Special Scholarship of the President of the Republic of Tatarstan. He maintains active concert career both solo and with orchestras.